No, Frank didn’t bake a shoemaker into a muffin with apple and cranberry. Even if it were delicious it’s decidedly immoral. Instead this muffin is the most confounded breakfast treat you’ll ever eat. Firstly, cobbler in a muffin: half as messy, twice as easy to eat. Secondly, cranberry and apple: antioxidants and a saying about keeping the doctor away. 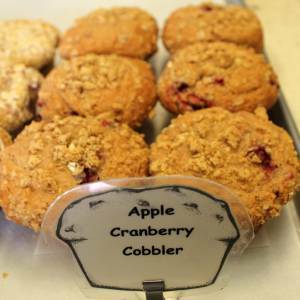 Thirdly, an apple cranberry cobbler muffin a day keeps the doctor away.